Looking at Windows 7 in our company environment, it appears very difficult to automate the installation of the video driver. To much darn security in the way. I have gotten past the prompt for trusting the publisher by pre-installing the certificate, however any method I have tried to install the video driver with leads to "Driver Installation failed." Does anyone have suggestions for automating the video driver installation on Windows 7? (MSI or something else scalable for 100s of computers. One could also copy the certmgr.exe, uvnc.cer, and devcon.exe files to computer C drives by other means than MSI if desired, i.e. logon script or similar, but I figured since I am making an MSI anyways, why not include everything. See Trusting Video Driver post for more information. In our company this is being done by SCCM with admin rights, screenshot below if relevant to anyone in the future. 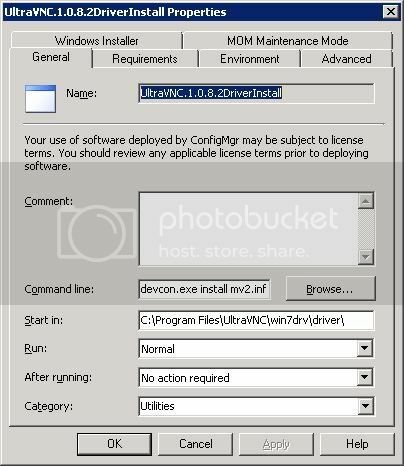 Note that the entire command line below is not shown; its entirety is â€œdevcon.exe install mv2.inf mv_hook_display_driver2"
Last edited by bridge on 2010-03-31 11:32, edited 1 time in total. Posted a powershell script to viewtopic.php?f=46&t=15904 which maybe helpful.